WEST LAFAYETTE, Ind. 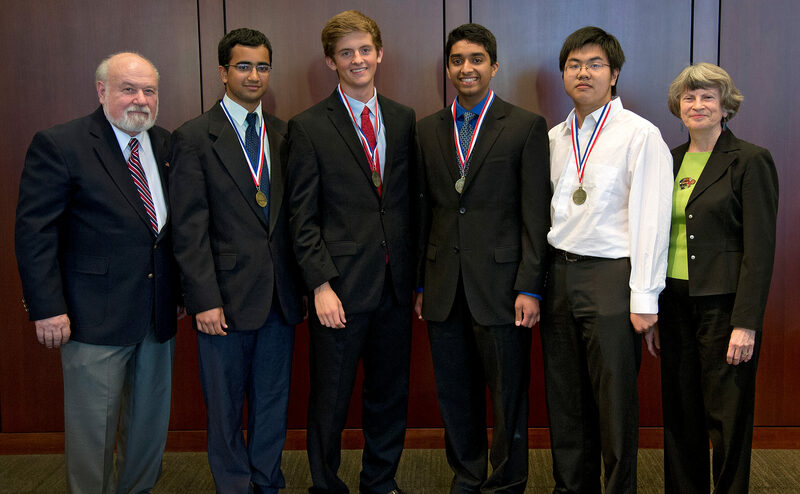 - High school students from Minnesota, Oregon, Virginia and Washington have been selected by the Center for Excellence in Education (CEE) to represent the United States at the 2014 International Biology Olympiad (IBO) next month in Indonesia. * Varun Mangalick, who will be a senior this fall at Mounds View High School in Arden Hills, Minnesota. * Abhijit Mudigonda, a rising junior at Westview High School in Portland, Oregon. * William Long, a rising junior at Thomas Jefferson High School for Science & Technology in Alexandria, Virginia. * Yilun Du, a rising senior at Pullman High School in Pullman, Washington. They will travel to Bali, Indonesia, to compete at the IBO, a worldwide event involving students from 63 countries. Kathy Frame, director of the USABO and special projects for the CEE, and Clark Gedney, director of the BioMedia Center for Instructional Design at Purdue, will accompany Team USA at IBO. This marks the fifth consecutive year that Purdue has co-sponsored the finals with CEE. Silver medalists at the USABO are: Grace Chen, Bridgewater-Raritan Regional High School, Bridgewater, New Jersey; Michael Gao, Freehold High School, Freehold, New Jersey; Siddarth Guha, Dulles High School, Sugar Land, Texas; and Catherine Wu, Canyon Crest, San Diego. Bronze medalists are: Peter Luo, William G. Enloe High School, Raleigh, North Carolina; Kevin Bao, Troy High School, Fullerton; Austin Wang, Flintridge Preparatory School, La Cañada Flintridge; and Zhongxia Yan, Davis Senior High School, Davis, all in California. Other USABO 2014 finalists are: Nithin Buduma, Lynbrook High School, San Jose; Jeff Chow, Cambridge Educational Institute, Chinos Hills; Jackie Osaki, Santa Monica High School, Santa Monica; Aneesh Samineni, The King's Academy, Sunnyvale, all in California; Boyang Dun, Canterbury School, Fort Wayne, Indiana; Erin Kim, Kappa Academy, Bayside, New York; and Peter Lu and Ming Liu, both of Mountain View High School, Vancouver, Washington. Earlier this week, the students took two exams - a practical and a theoretical. The four students scoring the highest on those exams won gold medals at the USABO and earned spots on Team USA 2014 to compete at IBO. Since arriving at Purdue on June 1, the high school students have participated in lectures, study sessions and laboratory exercises led by biology experts in fields that include microbiology, plant anatomy, physiology, ethology, genetics and biosystematics. While living in the Purdue residence halls, they also have toured research facilities in Discovery Park and elsewhere on campus. At last year's IBO, Team USA scored the highest overall team points and was awarded four gold medals. The team was composed of Charles Gleason of Hackensack, New Jersey; Nikhil Buduma of San Jose, California; Lei Ding of Wilmington, Delaware; and Catharine Wu of San Diego, California. Frame received the honor of being elected by her fellow jurors to be a member of Indonesia's Host Committee for the 2014 IBO in Bali. The Subgroup will work in cooperation with Indonesia to review the practical and the theoretical examinations that have been developed, focusing on the quality of the questions in terms of scientific correctness and conceptual formulation. The Center for Excellence in Education was founded in 1983 by the late Adm. H.G. Rickover and Joann P. DiGennaro, who now serves as center president. The center's mission is to nurture high school and university scholars to careers of excellence and leadership in science, technology, engineering and mathematics, and to encourage collaboration between and among leaders in the global community. CEE sponsors the Research Science Institute (RSI), the USA Biology Olympiad (USABO), and the Teacher Enrichment Program (TEP).